Four Freedoms Park has a brand-new, white, sandy beach, several shelters with picnic tables, and a wonderful playground. 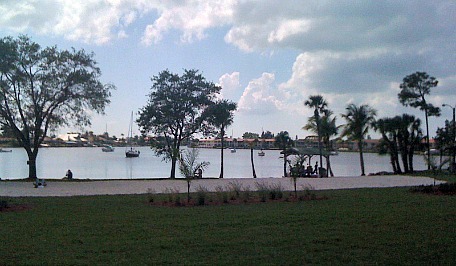 This Cape Coral beach was just opened in 2012 and is on Bimini Basin, which has gulf-access and is surrounded by a residential neighborhood. It's quite picturesque with the boats in the background! The beach is only for sun tanning or dipping your toes in, but is a welcome addition for when Yacht Club Beach gets crowded, and for those living downtown. Besides the beach, the park has a multi-use recreation building with a preschool and various programs for all ages of children and adults. You'll find playtime, music, and exercise classes, and they also have an equestrian program. Kids will love the playground and moms will like that it's fenced in. You can walk over to Ice Sssscreamin, which is right in front of the park, for an ice cream treat. A large grassy area is perfect for throwing a frisbee, having a picnic on a blanket, or taking a little snooze. 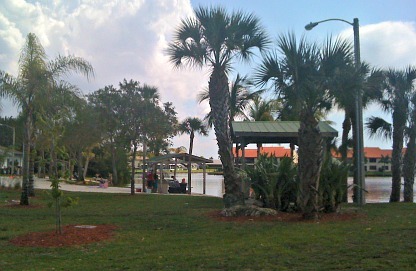 The Cape Coral park is lovely with it's many shade trees and attractive plantings. Four Freedoms is the site of several events, including family movie nights during the summer, the Cardboard Boat Regatta in April, and the Christmas Boat Parade. Restrooms are available and are open from sunrise to sunset. Grab your kids, pack a lunch, and spend the day playing, building sand castles, and having fun at Four Freedoms. 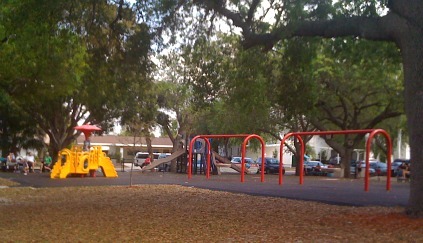 The park is off of Cape Coral Pkwy, just west of Coronado Pkwy, over by the 2 orange apartment buildings.